If you've been reading my blog for awhile you know I'm obsessed with my Sunday Funday brunches. I mean who doesn't love brunch? 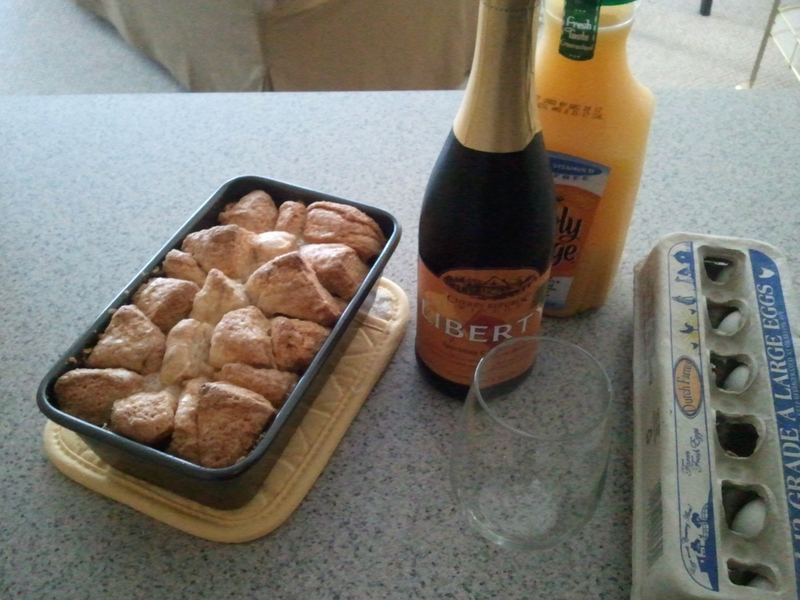 Last weekend I made my famous Monkey Bread with a tomato and spinach omelet and a special mimosa made with Cherry Republic's Liberty sparkling cherry wine. With the holidays just around the corner this Monkey Bread is sure to be a crowd pleaser. Preheat oven to 350 degrees. Combine the 1/2 cup of sugar and cinnamon in a gallon size ziplock bag. Cut each biscuit into quarters and roll each piece in the cinnamon sugar and place in buttered bundt pan or loaf pan. Mix sugars and margarine and heat until boiling. Pour this mixture over the biscuit pieces. Bake for 30-40 minutes and cool for 5 minutes before serving. Yum! Monkey bread is a christmas brunch tradition in my house. Even though I wished we had it year round!! I could totally go for a mimosa right about now ;) I wanna try a pomegranate one this year during the holidays. Yum!